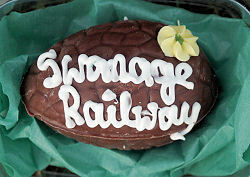 Easter weekend at the Swanage Railway - and an intensive service over the four days of the holiday weekend with hot cross buns for all passengers on Good Friday and Saturday and special locally made Swanage Railway Easter eggs for all children on Easter Day and Easter Monday. Passenger traffic was high - with some trains being standing room only! Motive power was provided by Swanage based Std 4MT 80078 and visiting USA S160 2-8-0 No 5197.